WHY ARE OUR PRESCHOOL TEACHERS LEAVING? 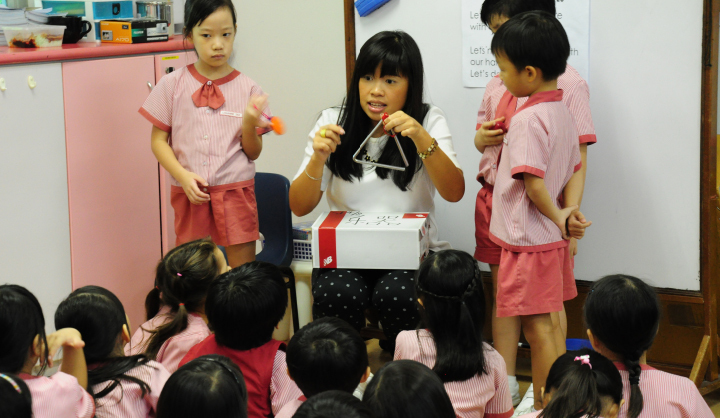 Presently, preschool trainee teachers in Singapore need to complete 200 to 500 hours of practicum to graduate from their diploma course. However, many of them receive limited or little mentoring during their practicum. Without proper guidance during their transitional phase from school to the real world, they give up halfway and leave the industry. Anecdotally, less than 50% of polytechnic graduates joined the sector after graduation. WHAT IS THE PRESCHOOL PRACTICUM CENTRE? HOW WILL STUDENTS BENEFIT FROM IT? The PPC provides a structured training programme for preschool trainee teachers undergoing the practicum component of their diploma, degree or masters degree courses. It helps trainees develop capabilities in classroom management, lesson delivery, documentation, curriculum development, professional development, personal development and team building. They will receive close guidance from host teachers and full-time Mentor Supervisors who will pass on their knowledge and skills using a multipronged approach of observation, coaching, guided reflection and discussion, and evaluation. WHAT DO TRAINEE TEACHERS THINK? Siti Suhailah bte Saleh, a final year full-time diploma student from SEED Institute, said that one of the most important things this practicum centre has done was to rekindle her passion for early childhood education. Having practicum teachers who were there to focus one-on-one with her was crucial for her development.